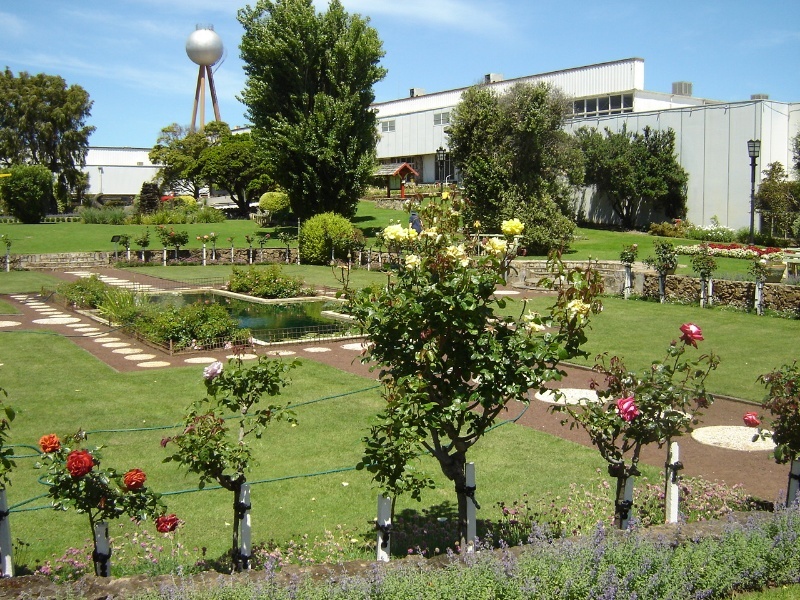 The Fletcher Jones Factory and Gardens were established in 1948 by David Fletcher Jones in Warrnambool. His "Modern New Decentralised Garden Factory" was a result of growing demand and advanced views of employee satisfaction and engagement. The company became renowned not only for the quality of its clothing - an iconic Australian brand - but also for Fletcher Jones' progressive approach to employer/employee relations and an innovative shareholding scheme. The development of manufacturing industries in regional centres occurred through decentralisation initiatives following the Second World War. Due to post-war shortages of building materials, Fletcher Jones bought a number of war surplus structures from the Army camp at Darley. Forming the basis of the new factory, these buildings were used as cutting rooms, sewing rooms, and a canteen. Fletcher Jones also purchased aeroplane anchors and heavy airways concrete blocks to be used as fencing and garden borders/features. In 1949 a Quonset hut was acquired and used to house a dry cleaning plant and alterations department. In 1951 a Bristol building was erected on the site adjacent to the original canteen and housed the mail order and accounts departments. In 1947 Fletcher Jones commissioned W.J.T. (Tag) Walter to create a modernist facade to the series of Darley buildings. Common features which were repeatedly used as advertising symbols were the Fletcher Jones (FJ) man and the roundel. The roundel had been used since the 1930s, and this feature exists on a pillar of the concrete anchor fence and the Lava Street elevation of the sewing room. A central tower featuring the FJ man and the roundel was built between the canteen and the cutting room, which was the location of Fletcher Jones' office. An illuminated advertising sign was placed adjacent to his office above the canteen and a curved glazed corner entry was installed between the tower and cutting room wing. However, this entry has been significantly altered and the tower above the first floor level has been removed, as has the signage. Between 1951 and 1974 the factory had numerous alterations and extensions. Two significant features were the Round Room and the water tower. 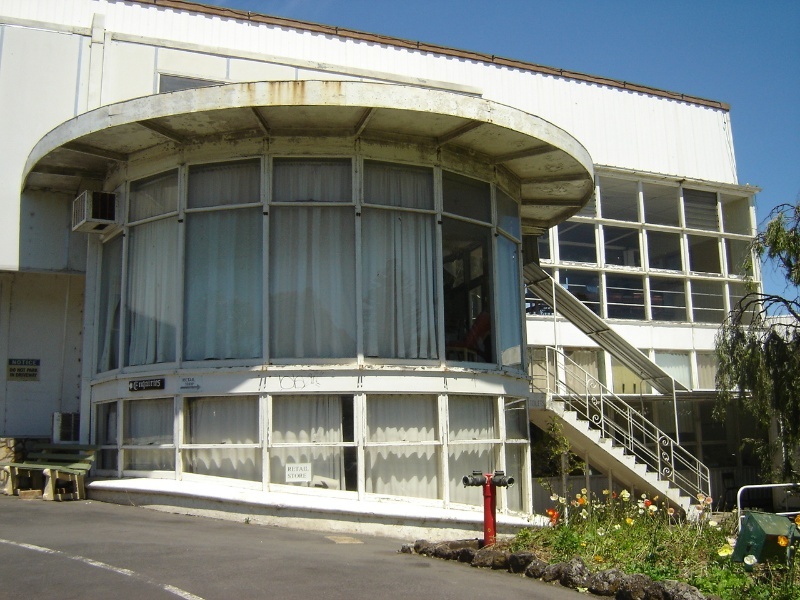 The Round Room was a prominent feature of the main facade, built in 1951as an addition to the original canteen. The 40 metre high water tower was built for fire protection and as a booster system in 1967. 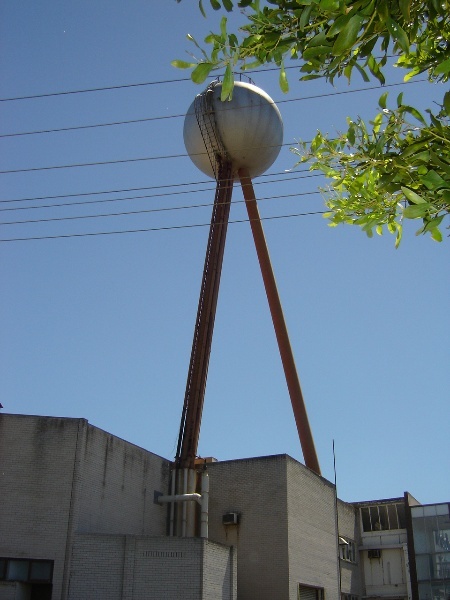 The tower's massive concrete foundations extend through the building and the elevated steel tripod and steel spherical tank tower over the complex. Fletcher Jones established an attractive ornamental garden setting for his employees. Work commenced in 1949 and the gardens were extended to the west in 1951. 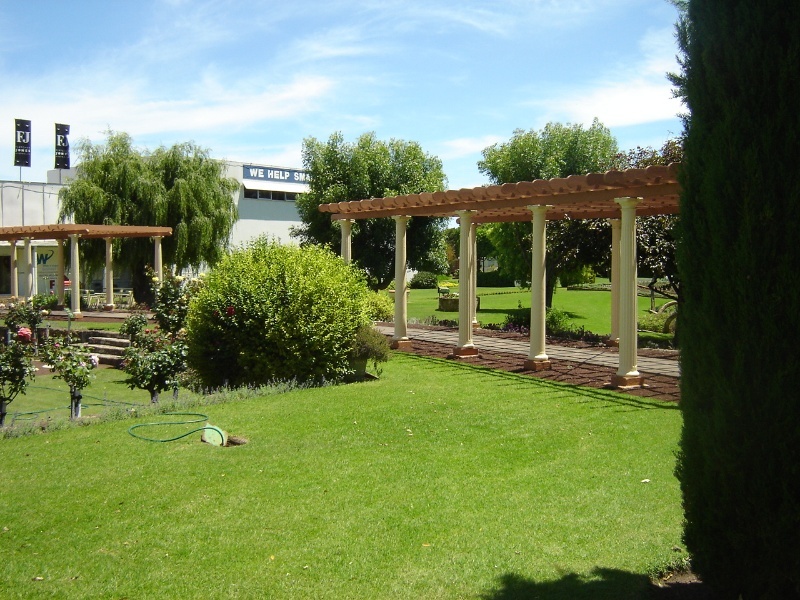 The gardens quickly became popular among employees, local residents and tourists. The highly manicured landscape consists of flower beds, lawn, rockeries, pergolas, a sunken garden and pond and several large floral baskets. Also located in the garden are a variety of sculptures, including a basalt sculpture designed by Warrnambool artist Robert Ulmann as a memorial to Fletcher Jones. Other sculptures include the Fletcher Jones man, a bas relief sculpture of a man clad in permanent press trousers and shirt, and the Sphere and Trilon sculpture, copied from the 1939 New York World Fair, which Fletcher Jones regarded as a symbol of progress. Even though the company expanded its operations to other sites, the Warrnambool complex remained the administrative and production hub of the company for many years. Fletcher Jones was knighted in 1974 for his services to decentralisation and the community. Fletcher Jones Factory and Gardens are of historical, social and aesthetic significance to the State of Victoria. Fletcher Jones Factory and Gardens are of historical and social significance because of Fletcher Jones' progressive approach to employee benefits and the firm he founded, Fletcher Jones & Staff Pty Ltd. He introduced an innovative scheme of shareholding and other progressive initiatives and services based on co-operative and consultative principles - termed the 'FJ Family' by the company. The degree of staff involvement in the company is unusual in the history of Australian business. 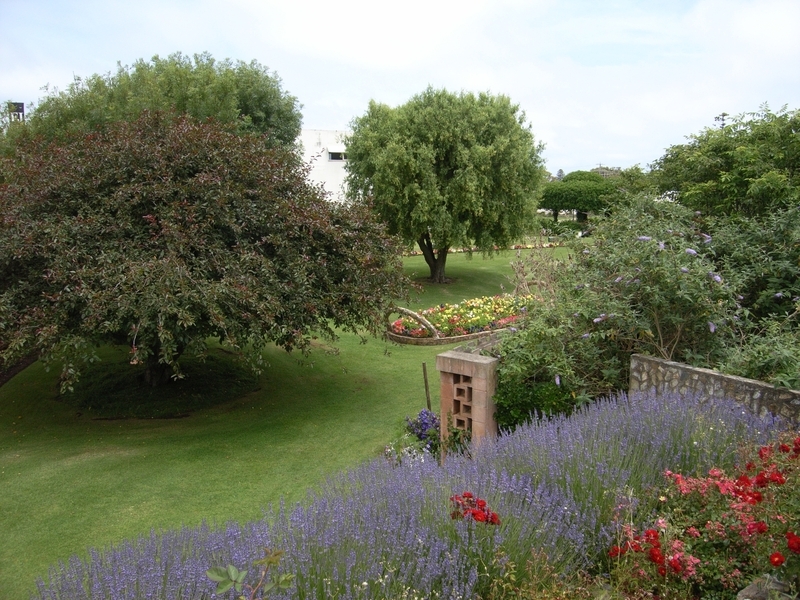 The company's distinctive ethos is reflected in the extensive and ornamental garden established for the enjoyment of staff and local residents. The Fletcher Jones Factory is of historical and social significance as one of the largest clothing manufacturers in Australia; its iconic Australian brand; its contribution to the 20th century manufacturing industry in Australia; and for the unusual and successful integration of surplus military structures, buildings and modernist facade in a factory setting. They reflect the resourcefulness and dynamism of Fletcher Jones in the use of war surplus structures and objects during a time of building material shortages. Throughout the complex are reflections of the post-war growth in population and in the manufacturing industry, and the Federal Government's support of decentralisation. The 1967 water tower is of social significance as a distinctive and visible feature, the design of which transforms a structure performing a utilitarian function into a structure of landmark prominence. The tower represents a clever use of a restricted site which did not allow for a traditional four-legged base. 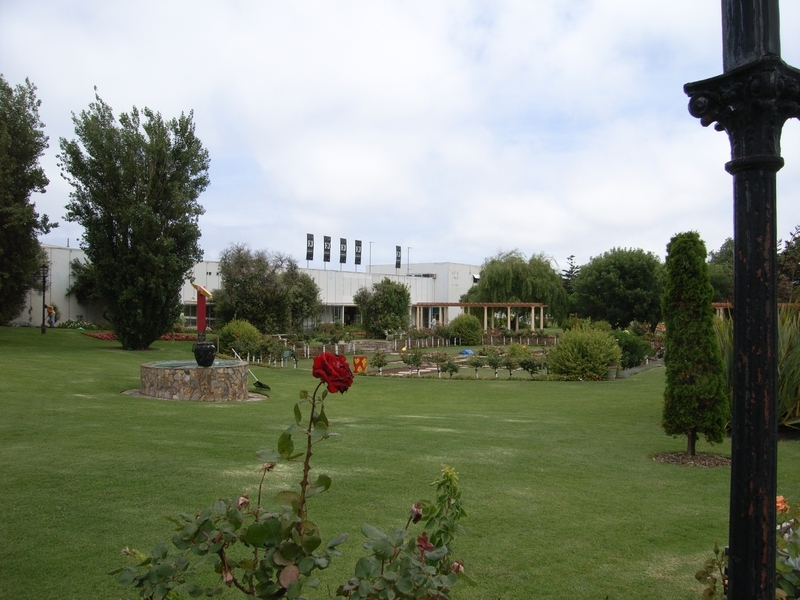 The Gardens are of aesthetic significance as a rare and outstanding example of a mid-twentieth century ornamental garden created in an industrial setting. The manicured lawns complement the sculptures, landscape structures, water features, rockeries, pergolas, urns, 'Monier' seats, flower baskets and beds with colourful and intricate displays of annual bedding plants. The planting features contrasting forms, foliage and colour with the use of uncommon vegetation such as Kentia Palms, strap leaves and weeping plants. Other distinctive features are the plants which are clipped into hedges, squares and balls. The planting was intricate and colourful, and maintained to the highest horticultural standards where neatness and control ruled. This style became a model for many small, post-war suburban gardens. 2. All of the land described in Certificates of Title Volume 7762 Folio 088, Volume 5710 Folio 834, Volume 5793 Folio 567, Volume 7370 Folio 851, Volume 7046 Folio 108, Volume 7297 Folio 308, Volume 5462 Folio 289 and Volume 5462 Folio 290 marked L1 on Diagram 2101 held by the Executive Director. 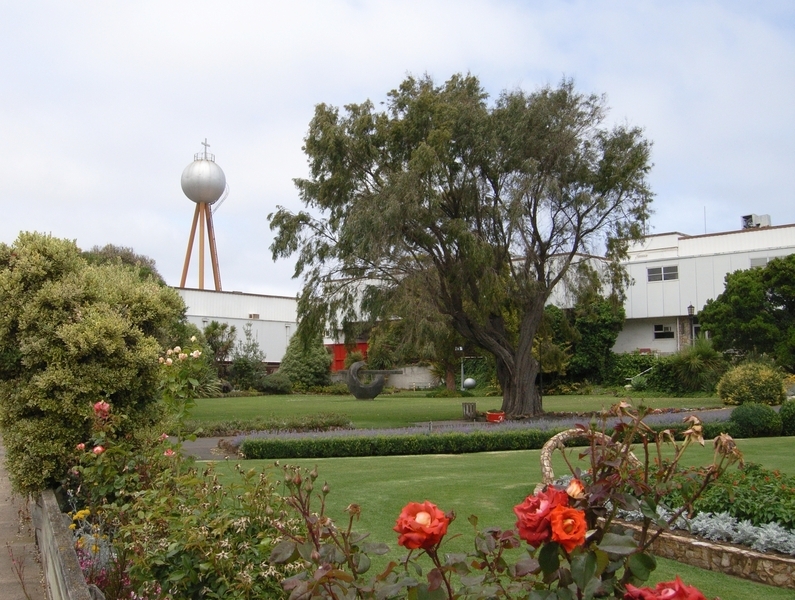 The Fletcher Jones Factory and Gardens were established in Warrnambool in 1948 by David Fletcher Jones (1895-1977). The Bendigo-born Jones became a travelling draper after serving in the First World War and in 1924 opened a shop and tailor's workshop in Warrnambool. During the Second World War he supplied men's trousers for the Department of Supply. In 1946 the company opened a store in Melbourne and the company had to increase the production facilities at Warrnambool to meet the growing demand. The company became renowned for the quality of its clothing and for its progressive management and ownership. In 1947 Fletcher Jones announced plans to build a "Modern New Decentralised Garden Factory" at Warrnambool. 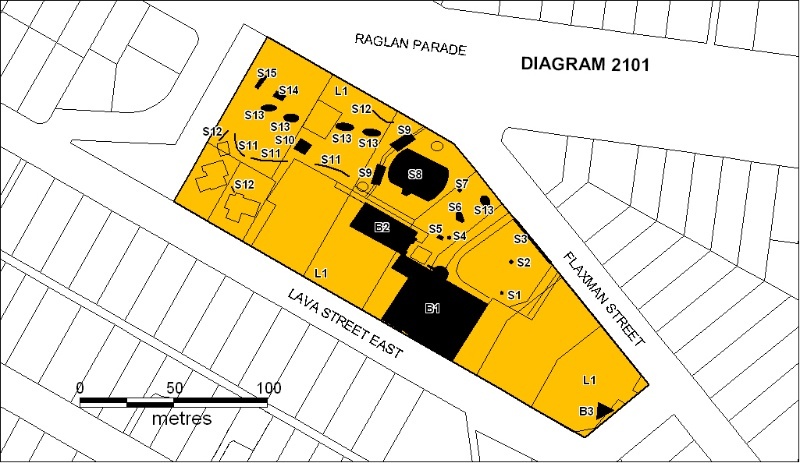 An old quarry site along Flaxman Street was purchased as were additional allotments stretching to Lava Street East and the huge task to clear the site began. The site was named Pleasant Hill and on 21 June 1948 the Hon. J.J. Dedman, MHR, Minister for Post War Reconstruction, laid the foundation stone. Due to post-war shortages of building materials, Fletcher Jones bought a number of war surplus structures including a collection of 17 buildings from the Army camp at Darley, near Bacchus Marsh, which formed the basis of the new factory. The Post Office was used as a cutting room and the Officers' Mess with a sawtooth roof became the main sewing room with a canteen built in front of it. Aeroplane anchors and heavy airways concrete blocks were used for a fence running partly along Flaxman Street. In 1949 a Quonset hut was acquired and used to house a dry cleaning plant and alterations department. Quonset huts were lightweight prefabricated steel structures with a semicircular form produced by the United States Navy in the Second World War. In the early 1950s a prefabricated aluminium building by the Bristol Aeroplane Company was erected on the site. W.J.T. (Tag) Walter, who in the 1930s worked as a carpenter for his father J.D.E. 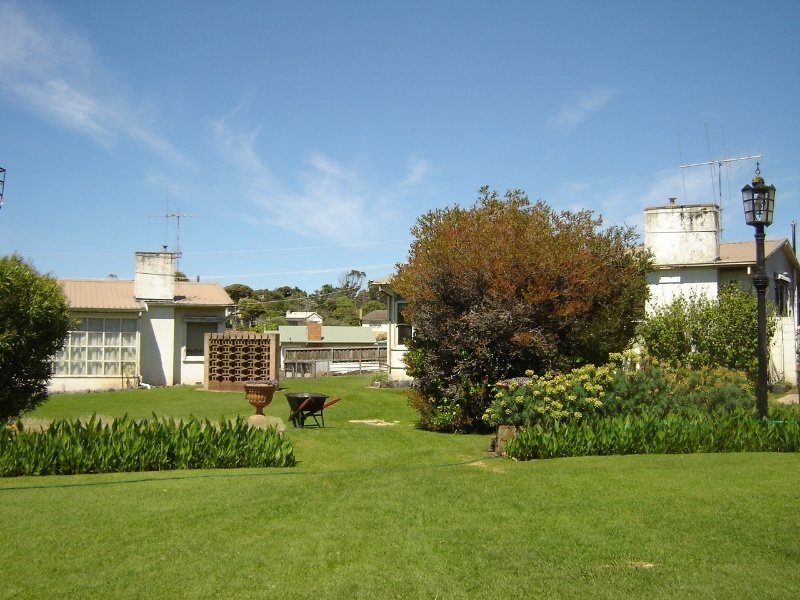 Walter, one of Warrnambool's most successful builders and land developers, was engaged By Fletcher Jones in 1947 to draw up plans for the design and appearance of the buildings on Pleasant Hill. He created a modernist facade to the series of Darley buildings which featured repeated use of the Fletcher Jones (FJ) man and the roundel as advertising symbols. The roundel had been used since the 1930s and is featured on a pillar of the concrete anchor fence and the Lava Street elevation of the sewing room. A central tower featuring the FJ man and the roundel was built between the canteen and the cutting room and contained Fletcher Jones' office on the first floor. An illuminated advertising sign was placed adjacent to his office above the canteen. A curved glazed corner entry was inserted in between the tower and cutting room wing. This entry has been significantly altered and the tower above the first floor level has been removed, as has the signage. In 1951 the company purchased additional land to the west of the site. Three houses for staff were built here in 1952 using designs from the R.V.I.A. Age Small Homes Service (Design numbers T316, T319 and T220), which had been set up by the Royal Victorian Institute of Architects in 1947 with Robin Boyd as its first Director. One of the houses (T316) was removed to make way for factory expansion in the late 1960s. The houses are timber framed and clad with conite. 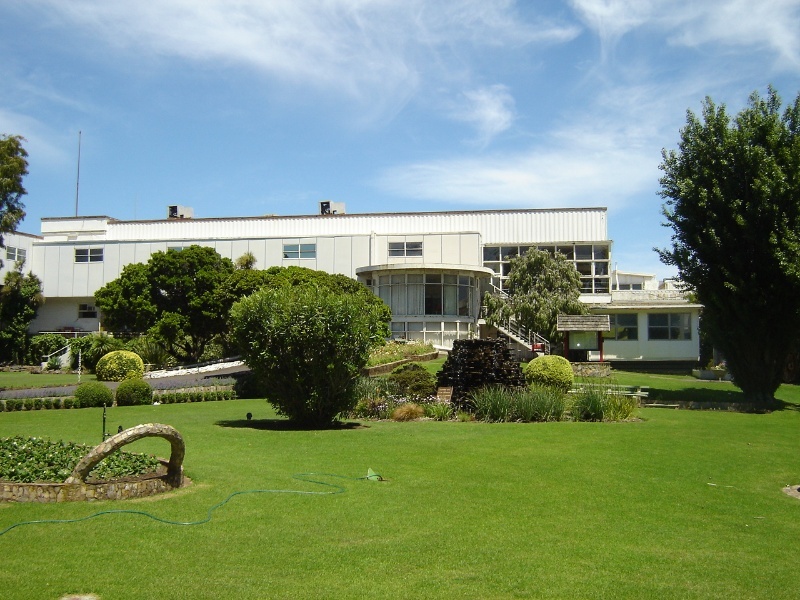 The Round Room, a prominent feature of the main facade, was built in 1951 as an addition to the original canteen. Also in 1951 a Bristol building was erected adjacent to the original canteen and housed the mail order and accounts sections. In 1955 a canteen was built on the first floor to the west of the Round Room. In 1959 a first floor was built above the original canteen as additional sewing space. Between 1958 and 1974 the factory was extended extensively to the east and west of the original factory buildings. The 40 metre high water tower was built in 1967 for fire protection and a booster system. The tower's massive concrete foundations extend through the building and the elevated steel tripod and steel spherical tank tower over the complex. Fletcher Jones set out to create an attractive garden setting for his factory and engaged his brother-in-law Darby Boucher to transform the quarry site with help from Tag Walter. Work started in 1949 and the gardens were extended to the west in 1951. The gardens became a popular tourist destination. The gardens comprise flower beds, lawn, rockeries, pergola, sunken garden and pond, large floral baskets made of Castlemaine slate added in 1955, and a number of sculptures, including a sculpture designed by Warrnambool artist Robert Ulmann as a memorial to Fletcher Jones, and the Fletcher Jones man, a bas relief sculpture of a man clad in permanent press trousers and shirt. In 1965 a peacock house was built in the western end of the site and altered in 1967 for use as a glasshouse. Even though the company expanded its operations to other sites, the Warrnambool complex remained the administrative and production hub of the company for many years. Fletcher Jones was knighted in 1974 for his services to decentralisation and the community. 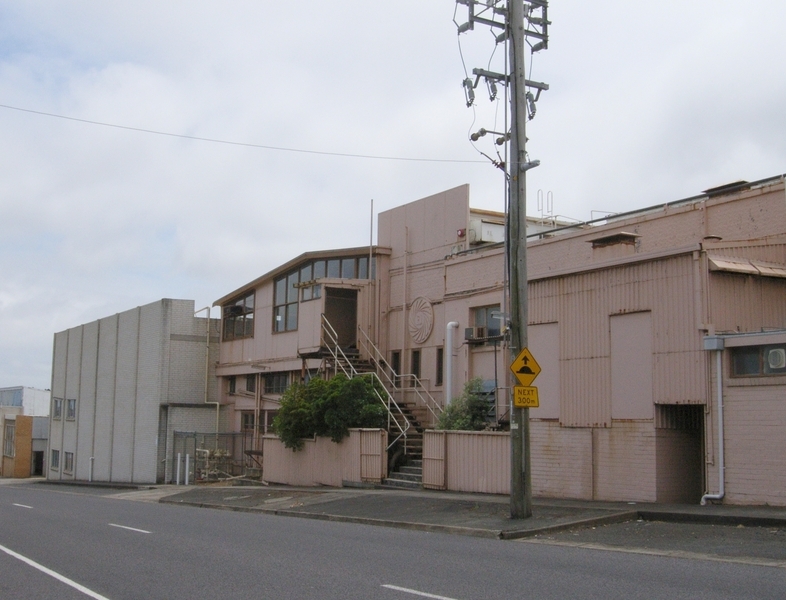 Warrnambool City Council purchased the site in 1992 and the company gradually wound down its operations at the complex until its closure in December 2005. Fletcher Jones Factory was established in 1948 by David Fletcher Jones whose clothing company was renowned for its quality and progressive employee relations. The ornamental gardens became a popular tourist destination. All works, including demolition and internal modification, but excluding exterior additions. The replanting of plant species to conserve the landscape character and planting themes. Non-commercial signage, lighting, fire safety and other safety requirements, provided no structural building occurs. Fletcher Jones Factory and Gardens have cultural heritage significance for their associations with the important clothing company Fletcher Jones & Staff and its founder and as a unique example of an extensive factory garden developed in the 1950s-60s. The buildings have architectural significance as a distinctive assemblage of structures, in particular the army surplus structures. The original form, materials and detailing of the buildings and structures should be maintained. The registered buildings form an integral setting for the gardens. Removal and/or alteration of registered buildings and structures would be subject to permit applications. The purpose of the permit exemptions is to allow works that do not affect the cultural heritage significance of the place. Alterations that impact on the significance of the place are subject to permit applications. All works to non-registered buildings and structures (including demolition and internal modification) are permit exempt, but any additions would require permits. Permits would be required for any new buildings, structures, landscape works, driveways and paths on the registered land. The conservation and management of the site should be undertaken with reference to Fletcher Jones Factory & Gardens, Pleasant Hill, Warrnambool Conservation Management Plan prepared by HLCD Pty Ltd, 2005 for Warrnambool City Council.